This list is for guidance only, and you should always talk to an experienced archer or coach for advice. What suits you is most important and what you see another archer using or doing may not necessarily be right for you, even if they are of a similar build. Discuss any purchase with a club member before buying anything. Some sections in the list below are for people new to Archery and some more thoughts have popped up while I’ve been putting this compendium together as I’m not sure whether some things should be introduced a little earlier in an archer’s career than they are now. Bad habits are very difficult to get rid of at any time, but if we can prevent some of them happening at an early stage then it must be considered worthwhile. Some things perhaps ought to be left until reasonable control is achieved, but a bow sling doesn’t take any thought to use and does enhance the shooting. All of my observations regarding shooting are from my own personal experience. That doesn’t mean I’m right! The place that you normally pull the string back to on your face, usually to somewhere on your chin and preferably your nose, so that the alignment of your head and the arrow-to-eye distance is repeated as consistently as possible. Keep your mouth closed with perhaps two teeth just touching (not clenched together). Where you draw to will depend on your build and where you feel comfortable. Ease of repetition is very important, so a couple of good reference points are very helpful. These can be made aluminium, aluminium and carbon combined or wood. There are arrows made wholly of carbon fibre, but we can’t use these on our outdoor ground, because if they miss the target we just can’t find them if they bury in the grass, even with metal detectors, and because they are all carbon they are light and travel faster, making the problem worse. Our field is also used for other sports so we have to find arrows if they miss the target. The only exceptions where arrow shafts made wholly of carbon may be used at our Club are for Clout Shooting and indoor Shooting, otherwise they must have at least a metallic core. Usually the points are of steel, secured with hot melt cement so you can take them out if they’re damaged, with plastic nock sat the other end to clip them onto the string and fletchings made of various plastic materials or feathers. A small arm, which may be of plastic, stuck onto the bow, providing a place for the arrow to rest. There are very basic ones, slightly more elaborate stick on ones with metal arms that are sprung so that they flip back if the arrow brushes them, giving a little more forgiveness, and bolt on ones with magnets that again flip out of the way and then spring back. People can and do get very good results with any of these. Prices vary alarmingly. As with all more complicated things, the more parts, the more chance that something will drop off! Principally used to check that the nocking point height is in the correct place for you. Set your bow up as you would normally for shooting. At about ten or 12 yards, shoot three fletched arrows at the target and then shoot an unfletched shaft from the same set and see where it hits, relative to the fletched arrows. Please allow yourself some latitude here on how well your arrows group, according to your skill and experience. If your fletched arrows group together with the unfletched one, great, everything’s ok. If the bare arrow hits above the group then the nocking point’s a bit too low; if it hits below then it’s a little high. This adjustment is quite important as it will affect how your arrows group. The height of the nocking point is affected by the arrow material used (in my experience,arrows with carbon in them appear to need a setting a little nearer to horizontal than aluminium). As well as setting the nock, the bare shaft test is used to check whether the arrows have the correct stiffness and /or the pressure button setting is correct. This is seen by where the bare shaft impacts, either right or left of the fletched arrows. For a right-handed archer, having a bare shaft hit slightly left of the main group and slightly low, at, say 7 o’clock seems to be more forgiving. BIRTHDAY PRESENTS. Please see Christmas. Essentially a strap or cord which goes around the bow handle and the bow hand wrist so that the bow isn’t gripped too tightly, as this can lead to tension in the bow arm. Knowing that the bow isn’t going to drop on the floor if you don’t hold it tight is a great confidence builder and enhances the shooting action when the hand is relaxed. A variant on this is the finger sling that has loops to go over the thumb and forefinger and around the front of the bow. Used to good effect by a number of archers, but in my experience it still takes quite an effort to prevent tension in the fingers, but once this is controlled quite effective. A length of cord with a leather cap at one end and a loop with a sliding rubber grip (saddle) at the other. The cap is normally placed on the bottom nock, holding the string on to the bow, and the sliding rubber grip (saddle) on the top limb. The archer then places one or both feet on the string (of the stringer) and pulls up the centre of the bow handle with one hand and slides the saddle as far along the top limb as it will go. 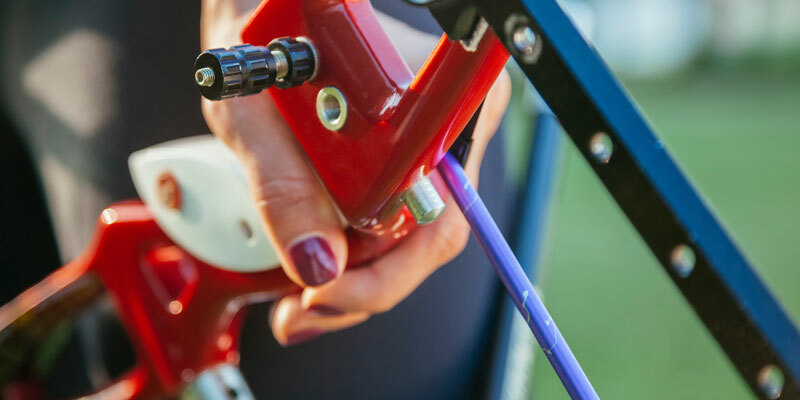 Holding the riser with one hand, the archer straightens up, pulling the bow up and bending it enough to put the top loop of the string in the nock location of the top limb.When the string is securely located, the tension on the stringer can be relaxed. Much easier to show in the doing than in the writing, but ultimately much safer for the archer and the bow, as there is much less chance both of the limbs of the bow becoming twisted and of the archer being hurt when something slips! In spite of all precautions, bow stringers, when left in your case or bag, inexplicably get knots in them and these knots are, almost without exception, extremely difficult to untangle if you don’t do it before stringing your bow. This is one of the mysteries of archery! (Sometimes called an arm guard) A guard for the arm holding the bow from being hit by the bow string, usually the after effect of a rather dodgy loose or an over-stiffened bow-arm, and helps to prevent clothing from getting into the path of the bow string. Made usually of leather or plastic and in different lengths. Shorter to protect your arm below the elbow, and longer to also protect the arm above the elbow. The distance measured from the string to a fixed point on the bow, usually from what is called the throat of the grip (the bit of the handle where your hand goes when you hold the bow, or the back of the bow (the bit furthest away from you). The distance varies according to how the limbs are formed and the length of your bow. The bow maker will generally give a maximum and a minimum measurement and the right place within these limits is the one where you get the best results. There is much opportunity for experimentation here! Essential to remaining in an upright position while shooting! In my experience rarely touched on in coaching, certainly during the early stages of an archer’s career; perhaps considered a little too much to give a new archer to think about. Perhaps not. Aside from any benefits of oxygenating the blood, introducing a pattern to breathing certainly helps to create a rhythm in the shot. Try taking in a deep breath before the shot commences, then breath out, then breath in as you draw the bow, not a gulp for breath, just a steady inhalation without filling the lungs to straining point. As you come to anchor, breath out a little and anchor and do whatever you do to aim. You should find that your body is absolutely still. This should usually coincide with that perfect moment when the arrow leaves the bow and hits the middle of the target. If it doesn’t, then you still have plenty of air to get the shot off with the minimum of fuss and movement. If you breath at full draw your shoulders will go up and down, which I doubt is conducive to a consistent shot. If you hold on so long that you run out of puff then you’ve taken too long anyway and might as well start again. About 5 seconds at full draw is probably enough, after that “things” tend to detract from the excellence of the shot. The speed and efficiency with which the bow will propel the arrow. A heavier draw weight bow will reach longer distances than a lighter one using the same arrow but a heavier bow would need a heavier arrow to match it so the difference isn’t always as much as you’d think. A light ACE (carbon and aluminium combined) arrow matching the bow will almost certainly travel further than a standard aluminium one but much depends on what your strings and bow limbs are made of (fibreglass and wood compared with those involving different amounts of carbon and other materials). Having a bow that matches your draw length is also important as having a bow that’s too long might be “nicer” to shoot but the recurves on the limbs won’t be working to their full efficiency. CHRISTMAS PRESENTS. Problems of what to buy someone for a present are solved forever when they are an archer. No matter how small the amount, or how large, there is always something that an archer will want (what that archer really needs is something totally different and is not relevant!). Essentially a guide to tell you that you’ve drawn the arrow to the same length on each shot. The arrow is placed under it and is drawn back in the normal way until it clicks, when the arrow may be released. This is in a perfect world! Some people manage very well without one. Some people swear by them and lots more people swear at them! Properly used, the clicker is a great aid to consistent shooting. Very few people use it properly. It should not be a trigger to release the arrow on the click, but it should go off pretty quickly after the click, unless you definitely don’t let the arrow creep forward or draw back further after the click. You mustn’t anticipate the click or all sorts of strange things happen with the shot, but the click must happen when you want it to. Complicated or what?! To begin with, we’ll assume that the arrows are the correct length and the arrow is drawn to just short of the clicker, onto the end of the pile (point) so there isn’t too much arrow to pull through at full draw. To keep the draw going is important, but then the click might go off too early. This is why the clicker must be set just right. The weather adds another facet to the equation. Getting the drawing action right and the balance in your back as it should be are all good practice and a clicker can help with this. Get someone who knows what they are doing to help get your draw check indicator in the right place with your correct arrow length. This isn’t something you ought to do on your own because you really can’t see for yourself what’s going on. A form of Archery based on medieval archery practice for battle and shot at longer distances than for normal target archery. (Generally 180 yards for Gentlemen, 140 yards for Ladies and lower distances for younger people, according to their age). The target is, however, much bigger, with a radius of twelve feet from the central flag, or whatever is being used to aim at.Scoring is 5 for a gold, 4 for red, 3 for blue 2 for black and 1 for a white. The original clout was a piece of material (or someone’s coat!) placed at a suitably long distance away.Recurve,compound, and Long bow archers may also shoot this form of Archery at Ardleigh. Different from other forms of archery as you can’t actually see what you’re aiming at because your bow arm is in the way, unless the weather is very windy! These are the bows that have wheels and cables and have what is called “let off”. This means that as you pull back the bow string, the draw weight at first goes up to the peak, or heaviest, weight, usually in the first few inches of the draw and then as you pull further back, the weight on your fingers reduces to what is called the holding weight. An example would be where a bow “peaks” at 50 lbs. and with a 50% “let off” the holding weight would be 25 lbs. These bows may be shot with ordinary tabs and fingers, but it’s more likely that a mechanical release with some kind of trigger mechanism will be used to draw back the string. Peep sights and lenses are also permitted with this type of bow. Can be used in all the forms of archery including Clout shooting at Ardleigh. The bit where you push out your bow arm and pull the bow string back to your anchor point. Achieved in various ways, either with what is called a “V” draw, which means that you bring the bow up, push it out and pull back the string in what is effectively one movement, or the “T” draw where you push out the bow arm first, bringing the bow up to the aiming position, then draw the string back to your anchor point, usually in two phases, the first few inches to tension the fingers and shoulder muscles, the second to bring the string back to your face, which is when the big back muscles should take over and do the real work of pulling and pushing the bow, so that these two forces are balanced equally. Should be done in a smooth and continuous movement until the arrow is released, continuing the draw even after this, in the follow through. 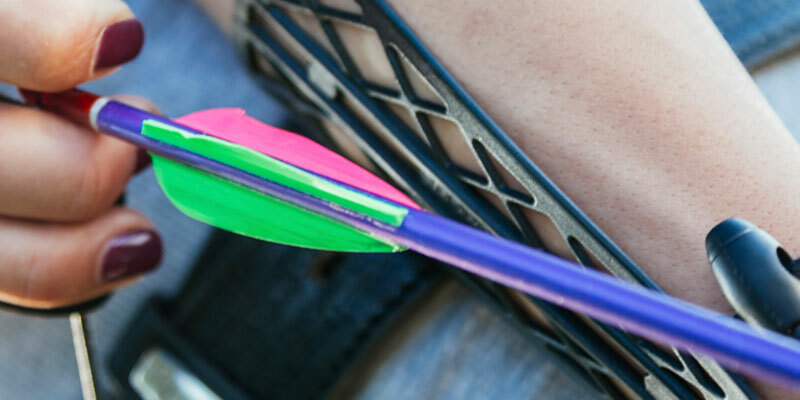 Having the push and the pull balanced means that when the arrow goes, everything should stay reasonably “in line” and give your arrow the best possible chance of hitting the middle. For a right handed archer, more push than pull may have an arrow hitting left of centre and, conversely, hitting right if there’s more pull than push. The length of arrow personal to you, measured from the nock slot on the end of the arrow to the end of the actual shaft and not including the point of the arrow. Draw length depends on how you are built and where on your face you draw the arrow to and it decides what length of bow is best for you. The shorter the arrow required, the shorter the bow. For a person pulling a 28 inch arrow, a 66 inch bow should be ok. A 68 inch bow of the same weight might be “nicer” to shoot, but will lose some efficiency compared to the shorter bow. It’s up to the archer to decide if the compromise is worth the benefit gained. The bow will be marked with a measured weight, say 30 lbs. at 28 inches. This will mean that if you draw a 28 inch arrow, the weight on your fingers at full draw is 30 lbs. Usually with modern weapons this varies by about 2 lbs. for each inch above or below the base length of 28 inches. This will mean that if you draw the same bow back to 30 inches then you’ll have 34 lbs. on your fingers at full draw. Similarly, if you pull a 27 inch arrow, you should end up with around 28 lbs. on your fingers. This is a very basic description as the design of the bow and where the manufacturers measure their products can vary. The maximum weight permitted for compound bows under G.N.A.S. Rules is 60 lbs. at full draw and judges at competition can (and do!) check it. Recurve Bows and Longbows have no restrictions on the weight used. A simulation of hunting, using various types of target at various distances, sometimes known and sometimes unmarked. When we shoot this form of shooting at our ground we shoot without sights or stabilisers (barebow), with compounds and longbows in separate competitions on a flat field, but competitions do take place in woods and closely covered land and over very varied terrain. Occasionally there will be what are called 3D targets which are actual animal shapes with scoring zones marked on them and at other times there will be ordinary targets. 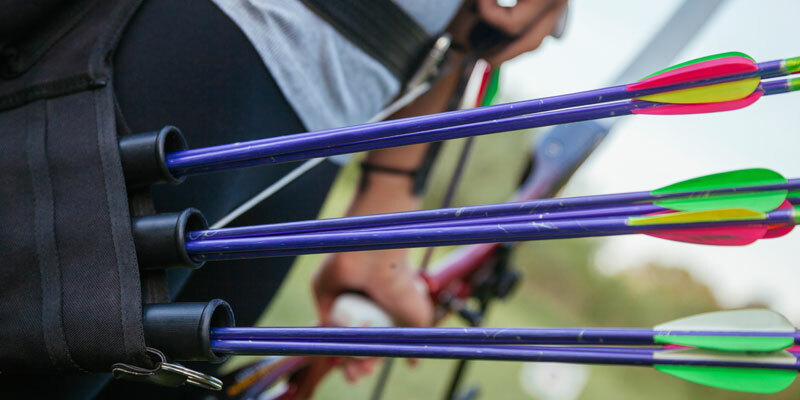 Competitions outside our Club include classes for Freestyle archers (which means you can use your normal target archery equipment),compound and long bows as well. Each class has its own awards. Generally 3 vanes on each arrow to stabilise its flight. These can be of plastic or feathers and come in a great variety of shapes, sizes and thicknesses and are glued on with fletching cement or double-sided sticky tape. The bigger fletchings straighten the flight of the arrow out more quickly and are good for bigger arrows indoors, but cause more drag and are more affected by weather conditions so are not generally as suitable for use outdoors, the smaller varieties generally being more popular. In much the same way as a golfer’s swing continues after the ball is hit, then an archer’s shot should continue after the arrow has left the bow. The bow arm should remain extended towards the target and the drawing hand should remain by your head and your aiming eye should still be holding on the gold, or wherever you were aiming, until the arrow strikes. This way you get maximum feedback from your body to your brain on the result of the shot and it also maintains your aiming mechanism, on automatic, if you let it. A mark to help you to find your place on the shooting line at each end of arrows. Two can be used to help keep your alignment to the target consistent through the shot but then these must be adjusted when the targets are moved for each distance. One mark is generally enough and stand how you feel comfortable; something exaggerated might become more difficult as a shoot progresses. Standing in the same place each time helps people line up their telescopes as well! These are available from the Grand National Archery Society. Using these, an archer has an allowance added to his score so that a group of archers of different abilities may compete more equally with each other. Usually run in conjunction with a competition. When you have shot three rounds indoors, then you can be assessed for your handicap rating. When you then enter a club competition you will receive an extra allowance, which is added to your score. The more experienced archers will have a lower amount added to theirs so you will be competing on equal terms (beginners will generally be steadily improving so the dice are a little more weighted in their favour). The outdoor handicap is assessed on different rounds so the two handicaps are kept separate. The Handicap Tables are quite straightforward once you understand them, but there are some archers to whom it remains a profound mystery. This is why we have two Records Officers who take on this arcane and hallowed task. The Handicap Tables also permit archers using Recurve bows, Compoundbows and long bows to shoot against each other as they do not generally compete on straight score. The part of the bow that you hold in your bow hand that doesn’t bend. Also called the riser. Shot in the barn we use at Bretons. Smaller targets, but at closer distances. The parts of the bow that bolt or clip onto the handle and bend when the bow is drawn. These store the energy in the bow until you loose the arrow, when the power transfers to the shaft. Used by traditional archers. A much simpler weapon, generally one piece, laminated from two or three woods or made of one piece of yew (called a self bow). Doesn’t have any extra bits screwed on and is best shot using wooden arrows. There are three permitted methods of aiming. Firstly, a rubber ring to slide up and down the bow handle to help consistency of aim may be used; secondly, an aiming point, usually on the ground, on which you align the point of your arrow and thirdly without any rings or things to line up with, you instinctively bring the bow to the shooting angle and loose when ready. All the methods take much practice and the last more so. May be used for all the forms of Archery we do at Ardleigh. The bit where you don’t hold the bow string any more (different from letting go). Rather than opening your drawing fingers, you relax them, a much easier thing to do, and resulting generally in a much smoother release. Loosing of the string isn’t the end of the shot, just a part of it, as the draw before the loose is and the follow through after, it’s all part of the same thing. You must decide before the draw how the shot is to be executed. This is where confidence comes in. Where there is doubt there will almost certainly be failure.NEVER loose the string without an arrow in the bow. On the arrow, it’s the bit that clips onto the bow string; on the limbs it’s the carved section at the end, where the string loops locate. The place on the bow string where you clip the arrow. It needs to be firmly set, otherwise the arrows will never hit the target consistently. People generally use either dental floss or brass rings, often one below and one above the arrow, but sometimes only one below the arrow. Dental floss is kinder to tabs. Should be set a little above the level of the arrow rest. This is very important when you tune your bow. Found usually on recurve bows. (Compound bows have a similar arrangement, but within the arrow rest. Helps a wider range of arrows leave the bow more cleanly. (Please see spine). Also important to use with the thinner metal handled bows where they are cut “over centre” to centralise the arrows on the rest (this is not the place to go into the reasons why!). A pressure that makes the arrow react with the effect of a stiffer spine would, in my experience, appear to be more forgiving in the event of a “dodgy”loose. The bows that you will see most of us using in our Club, most of the time. Usually now a bow with a separate riser and limbs having a curved shape bending away from the archer at the limb ends, which gives the bow a better cast. Can be used in all the different forms of Archery that we do. Another name for the bow handle. Can be made of wood, usually laminated, fibre compound, cast, forged or milled aluminium alloy, aluminium and carbon or all carbon. All available at very variable prices from reasonable to alarming! Combinations of various distances and number of arrows shot, details of which appear elsewhere on this site. All our competitions, both indoor and out revolve around these. Arrangements can also be made for our younger members to take part in the Association for Archery in Schools Award scheme. This is based on the first three dozen arrows shot at the longest distance in any round. When shooting is taking place, it will be under the control of a Field Captain who will indicate when it is safe to shoot, but every archer can play a part in this. If you see anything that gives a cause for concern, then call out “FAST” and all shooting will cease, even if an archer is at full draw they must let down the bow and wait. (This is where the term “playing fast and loose” probably comes from.) (Never put an arrow on your bow or draw it unless you are on the shooting line and pointing your bow down the field, with no one between you and the target Even without an arrow you should still follow this procedure, because apart from the obvious reason, you can’t see from the front that there’s no arrow on the bow. The outdoor target rounds measured in yards are called Imperial and are always shot at four foot targets, whatever the distance being shot. The gold scores 9, red 7, blue 5 black 3 and white 1. The metric rounds are measured in metres and 2 sizes of face are used. All score 10 for an inner gold down to 1 for an outer white. Generally in practice we keep our own scores, but for competitions the scoring is shared, with you scoring for your partners and them scoring for you. This is why it’s important for you to keep your own score and agree totals throughout the shoot. The score on the sheet you sign is the one that counts, not the one in your score pad. How your bow’s bracing height, nocking point,pressure button and stabilisers are set up to get the best results for your way of shooting. Please see tuning. The binding above and below the nocking point on the string, and the loop ends of the string. This helps to counteract excessive wear on the string fibres and also makes the string a little more comfortable on the fingers. Another name for the body of the arrow. These are the arrows that you shoot before the scoring of arrows begin. Usually you get 6 shots (with one or two exceptions), shot in two ends, each of three arrows, and these are used to see where you should set your sight for the first distance that day, and should also be used to get you into your shooting pattern. It can vary according to weather conditions and, to some degree, how you feel. You only get 6 at the longest distance and, if you are doing a double round over one day, only on the first round; after that, everything counts (or doesn’t!). The weight of the bow and the length of your arrow decide how thick the arrows you use will be. If you shoot an arrow that is too thin from a bow that’s too heavy there’s a fair chance that the arrow will bend or break so the arrows must be reasonably matched to the bow if they are to fly properly. You’ll see most recurve archers using these and some compound archers. All vary the feel of the bow in your hand and how the bow behaves. The long rod at the front certainly delays any subtle errant movement of the handle that may affect the flight of the arrow until it has left the bow. The shorter twin stabilisers at the back counterbalance the long rod at the front to a degree and also affect the feel of the shot. You must find what suits you best. The long rod and twins are quite good for the heavier bows, but there are certainly good reasons for trying alternative arrangements, such as long rod alone, or twins alone at the front. A reasonable degree of drop forward as the arrow leaves the bow seems, in my experience, to help the arrow to clear the bow better and also seems to be a little more forgiving if errors are made, but if you put 10 archers together you may well get 11 different opinions about what works and what doesn’t. Modern bows are made relatively light so stabilisers would seem to be fairly necessary anyway, where the older bows with wooden handles had some stabilisation built in, some even with mercury inserts. Stabilisers also help to cover up most of the really radical faults in your shooting that we’d really rather you didn’t do anyway, but hey, nobody’s perfect! The score made by an archer without adding their handicap allowance. Championships are decided in this way, but usually within these there are separate handicap competitions in which everyone entered takes part, if they have a handicap rating. May be made from various materials. These can be purchased ready made from archery shops or, if you are inclined, you can make your own. The number of strands can be varied, according to what material is used or what weight the bow is at full draw. Most of the strings you will see on the beginners’ bows at our club are of Dacron B50. Most of the strings you’ll see used in competition will be made of Fast Flight or some similar material, which has less stretch and gives more cast to the bow. This material is not as forgiving as the Dacron if your loose isn’t quite right, but this is perhaps because Dacron is a little bit slower and not quite so “explosive”. When the bow is drawn to the anchor point, it is important that the string is aligned on the bow consistently. The string at full draw, being so close to the face, can be seen as a blur, but should still be aligned vertically to the same place on the bow handle. Some people use the left side of the sight window, or the centre of the handle; others use the right hand side of the sight ring. Generally, it’s more comfortable (for a right-eyed and therefore right-handed archer) to keep the string to the right of the sight ring or pin. The form of archery most people will be familiar with – shot at a more or less vertical target, usually composed of a series of concentric rings, often of different colours. See Scoring. A finger guard, usually of leather or similar synthetic material, or a combination of both. Helps to prevent the fingers getting sore, but more importantly helps you get a cleaner loose. We usually recommend people to use a ledge tab (one with what’s called an anchor plate) as in the early days of shooting this is easier to feel on your chin and gives a more positive feel to your anchor point. As with most other things in Archery, though, this is entirely a matter of personal choice. The way of setting up the bow so that as much of the energy stored in the limbs as possible is transferred straight up the back of the arrow when it’s loosed. This involves adjusting one or more of the pressure button,bracing height and nocking point on the string until the fletchings have as little work to do as possible to do to straighten the flight of the arrow. A shaft that clears the bow with as little erratic movement as possible will fly truer and be less affected by weather conditions. Often, people will blame themselves when their shooting isn’t going too well and analyse what they are doing to blazes before they’ll check their tuning. No amount of good shooting will solve the problem of a set up that isn’t right. When you are bringing the sight onto the target, instead of raising or lowering your bow arm to do it as this can affect how your muscles work and also cause an inconsistent draw length. Try drawing your bow to your anchor point and see where it is in relation to the target. If it’s higher then bring the sight pin down, if lower then move it up, not by moving your arm but by moving at your hip. This keeps everything in line. I used to find my sight was on the target at 80 yards (didn’t have to move it then!) when I drew the bow to full draw so all it needed was an adjustment at the hip, keeping all the muscles balanced and in line. Before you start to shoot, you should warm up your muscles by either stretching or pulling one of the various tension devices that get the muscles working. Pulling a bow with no preparation for it can come as quite a shock to the body and it also seems to help the mental side of things get ready for shooting as well.